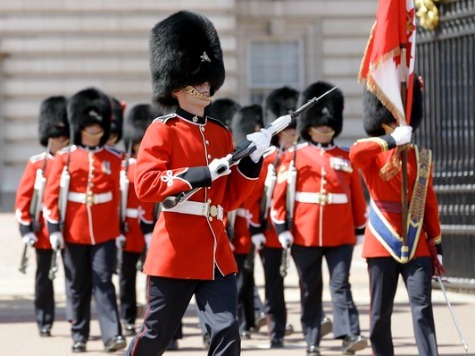 Buckingham Palace has added good guys with guns to its line of protection in the wake of the October 22 terror attack against the War Memorial and Parliament Hill in Ottawa. According to CBC News, the palace has heretofore been “protected full time by four ceremonial guards–two on horseback and two on foot.” But the attack on Ottawa showed the dangers of this approach, and “heavily armed security personnel” have now been added. The armed personnel have been stationed around and near the entrance to Buckingham Palace since the start of this week “as the result of a security review that was ordered by British Prime Minister David Cameron” following the Ottawa attack. The personnel are “keeping watch over the ceremonial guards as they perform their ceremonial duties, just like Corporal Nathan Cirillo was doing [in Ottawa]” when a recent convert to Islam gunned him down.